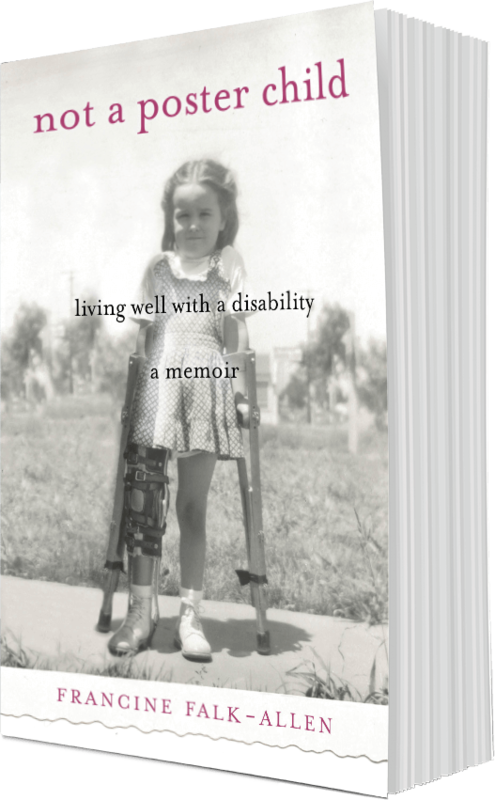 There was a day in sixth grade when my polio leg ached so much that I could not stand, and it was terrifying for me. This was the first time I had had pain in that leg since the initial onset ten years before. I began to cry, right in class; my teacher, Mrs. Hyatt, asked me what was wrong and I whispered my discomfort and fear to her. A big strong seventh grade coach, Mr. Long, was called to the room; he came and picked me up as if I were a three-year-old, like a damsel in distress, and carried me to the nurse’s office where I rested until my mother came to pick me up. She was annoyed and even angry that I would “pull this” and call her away from work. She had been a child who would do charades to stay out of school, whereas I considered a sick day at home a huge loss of social time at school. The nurse in the office said I was probably having growing pains. I had thought that was a metaphor, but apparently some kids actually do have muscle pains if they get a growth spurt. I was hoping this was true and that that sorry little leg was going to finally stretch on out. No such luck, however. Not long after my leg collapsed, I overheard some girls who I thought were my friends discussing me, two in the bathroom stall next to me, entering right after I did, saying that I “just wanted to be pitied.” It seemed clear they had staged this so that I’d hear it. I was appalled that anyone would think I wanted pity, and searched my soul to see if there was truth to this; I could find none.